First thaw the frozen strawberry concentrate and strained it through a fine mesh strainer. This creates a strawberry simple syrup. Pour the sparkling wine into large white wine glass, then add the Triple Sec. Next add the lime seltzer. Now, using the back of a spoon, pour the strawberry syrup over the spoon near the edge of the glass so that the syrup sinks to the bottom of the glass. 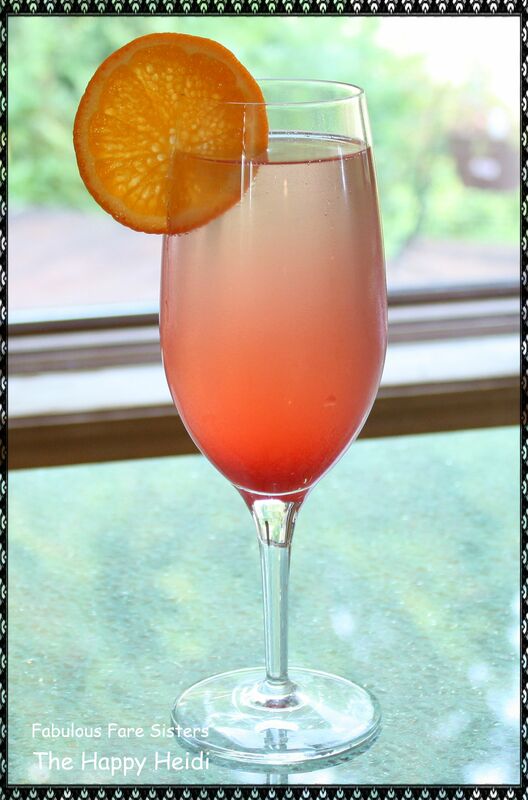 Run an orange slice along the rim of the glass and place on rim for garnish. Now take a sip and you will be as happy as Heidi! Love the name, cocktail corner ! …saunters up to the bar…. You’ll love it! It is the perfect ‘Girly’ drink! The happy Lacie! Lol! This looks yummy! Oh MY this looks lovely! The strawberry syrup is the perfect addition!